If you have an ongoing health condition that requires prescription medication, you're well aware of how expensive it can be. Rising medication costs have increasingly hurt consumers' wallets — and their health. In fact, in a recent survey by Consumer Reports, 17 percent of respondents said they didn't fill a needed prescription due to cost. 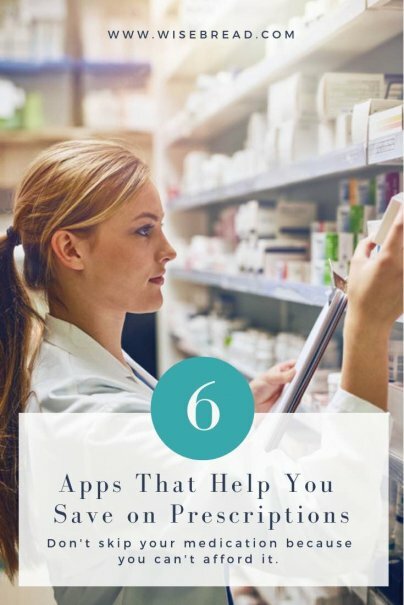 The Easy Drug Card is a discount prescription app you can use to save money on your prescriptions, if you don't have insurance or if your insurance won't cover the cost of your medicine. What sets the Easy Drug Card apart from similar apps is that you can also use it to save on your pet's medications, too. With the Easy Drug Card, you get a discount of up to 80 percent off your prescription price. FamilyWize is a free app where you can download or print off a discount card and use it at any major pharmacy. This app is for everyone, whether or not you have insurance. Hand the card to the pharmacist, and they'll enter the card's information. The FamilyWize card is accepted at all major pharmacies, and the average savings is 40 percent per prescription. Most people go to the same pharmacy to fill all of their prescriptions. It's easy and quick, but you might be paying a premium for that convenience. Prescription drug prices can vary widely from pharmacy to pharmacy, even if you have insurance. For example, if you needed to fill a prescription for Lipitor in the Orlando area, you'd pay $23 at Walgreens. But, if you're willing to drive to Costco, you'd pay just $10 for the same exact medicine. ScriptSave WellRx helps you find the lowest price on your medications and offers discounts to help you save even more money. Just enter the name of your medication and zip code, and the app will tell you which local pharmacy offers the cheapest price. Download the ScriptSave WellRX savings card, and you'll save up to 80 percent on your prescriptions. It's especially helpful for those without insurance or who have very high copays. With the CVS ExtraCare app, you can manage your prescriptions and sign up for the Health Rewards program. With this program, you can earn credits that can be redeemed for Target coupons. As you can see, these credits add up, and you can use the coupons on most items in the store, including food, gifts, or housewares. The Walgreens app is a comprehensive tool you can use to manage your family's prescriptions. You can transfer prescriptions, order refills, and even chat with a pharmacy expert through the app. Earn 100 points for every 30-day prescription picked up in-store. Earn 300 points for every 90-day prescription. Earn 100 points per vaccination. Those points can be redeemed for discounts at the register.